ohhhh gretha wat een leuk kaartje weer en wat een lieve stempel. Super mooi weer, prachtige kleuren ook..! Heel erg mooi/ lief kaartje..! Een heel mooi kaartje, Gretha. What a beautiful card, Gretha. I love the shape, your layout and all those pretty embellies. They set off that adorable image so well. Beautiful card.love thisstamp.cant wait for the release. Love the pink and green together. gorgeous card love your colouring!!! Beautiful card Gretha. The colours you have used are lovely as are the embellishments and die cuts. Love it. Und wieder so eine traumhaft schöne Karte! Je hebt dat weer prachtig gedaan, zoals altijd super mooi. So cute! Great Easter card for my granddaughters! Thank you for sharing! Wow! Absolutely beautiful work on this lovely card...it frames the darling image so well. Love your details, embellishments, layout and fabulous coloring, too. Schitterende Gretha wat een mooie kleuren heb je bij elkaar gebruikt. Oh this is such a beautiful card!! Love it! This is stunning Gretha. Love the adorable image and such a beautifully layered and embellished card. Schitterend kaartje weer en ook weer zo'n leuke stempel. Super mooi. 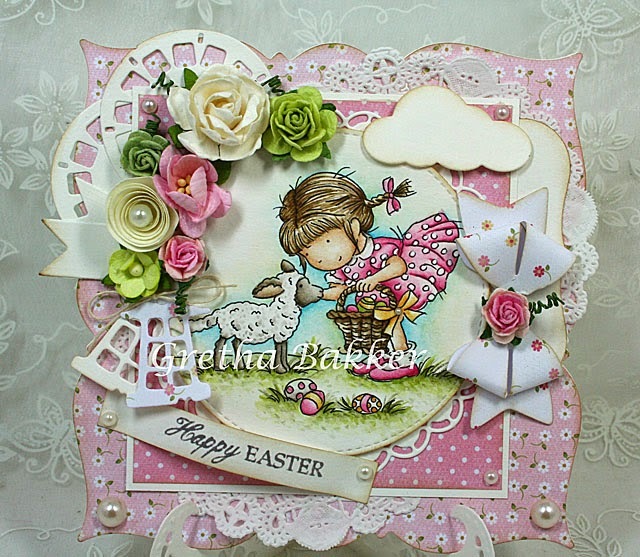 You have created a fabulous Easter card, I love the really cute image with the little spring lamb. You have used some lovely embellishments and a great layout on your shaped card base. I think this is my favourite image! Lovely! I have not heard of Sennelier; I must look this up! Very sweet motive turned into a great card! Awwwww such a sweet image! Stunning colouring and gorgeous detailing too. This is such cute Easter card. You always have the best coloring on your images. This is gorgeous Gretha. I love the new stamp and you've coloured her beautifully. 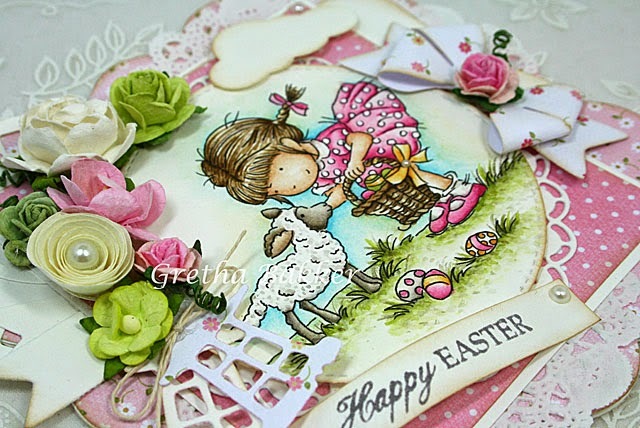 Wonderful Easter card, love your colouring! Gorgeous card!! The image is super cute! I love your coloring and all of the elements you added to your design! Thank you for sharing your card with us! Your colouring brings the image alive, so beautiful. Thank you for sharing and for the amazing inspiration . Love your card! 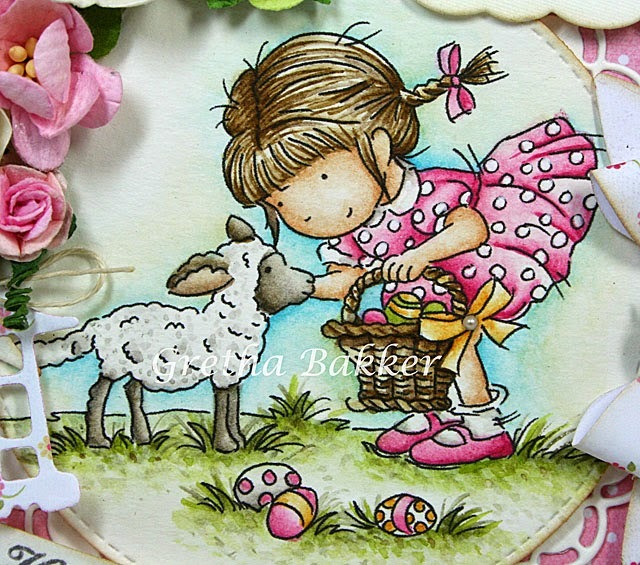 The lamb and little girl are so cute—a lovely Easter card! Great job! Mooi frisse kleurtjes,ik wordt er helemaal vrolijk van. Beautiful card! I love the Little Lamb image and your beautiful coloring! Pretty details on your card! This is such a beautiful card! I love the Spring colours and your gorgeous colouring of this sweet image.